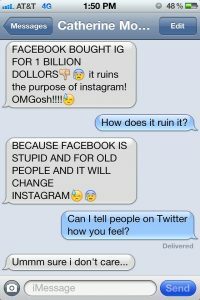 “FACEBOOK IS STUPID AND FOR OLD PEOPLE“, my 12 year old daughter texted me yesterday after FaceBook offered to purchase Instagram. If you have teenage or pre-teen girls or boys, this demonstrative behavior isn’t anything new. What I didn’t fully understand at the time is what a firestorm the acquisition set off in the community. Of deeper and longer-term significance, however, was the spotlight my daughter’s text to me shined upon the newest and most natural trend in social media; verticalization or specialization, which will reshape social media as we know it today. As I probed to better understand what my daughter meant and how she felt by her text to me, she explained that with Facebook owning Instagram, it would ruin its entire purpose. Probing further, she feared that Facebook, because it’s for “old people”, would “change Instagram.” Taking this offline, she explained a few fears. For her, Instagram is a world for her and her friends in her grade that was protected from Facebook gawkers and lurkers. Her thinking was that by Facebook owning Instagram, those gawkers and lurkers would invade her and her young friend’s world. Mark Zuckerberg promises a standalone Instagram, but will, of course, import all the pictures in their context and metadata, to be monetized like everything else is in the Facebook network. My daughter wasn’t alone in her fears. Like Mathew Ingram reported in GigaOM, many other people, including grown adults, were airing their grievances. Many even retweeted my daughter’s text in a sign of protest. As of right now, the text had been viewed on Twitpic over 71,000 times and was retweeted over 3,200 times. While the protesters probably represented small but vocal minority, they certainly were a passionate and diverse group. All of this passion highlights a theme I’ve been researching for a few months, the verticalization of social media. Over an extended period of time, all markets go vertical or specialize, all the way to the point where the market cannot support any more divisions. Sometimes the segmentation is too gray and not demonstrable enough to support the business model. Look at TV channels, cars, tooth paste, and shampoo. They have all segmented beyond belief if you been alive long enough to see it from the beginnings. Cars are a good example. At one point, there were very few different types of cars consumers would want to buy and that manufactures offered. Now it seems that every brand has sedans, coupes, mini-vans, station wagons, SUVs, “minis”, sports cars, trucks, hybrids, etc. TV sport is another good example of specializtion. When I gew up, I could only watch sports on one of four network TV stations at very regimented times of the day. Now, from Austin’s Time Warner Cable, I can get access to over 50 different sports channels whenever I want, 24 hours a day. I see the same situation playing out with social media. Pinterest– Lifestlye social interactions around the “beautiful things you find on the web”. GetGlue– Entertainment social interaction around what people are watching on TV, at the movies, playing, reading or listening to. Foodspotting– Food social interaction between people who like to eat out and show off what they’re eating. Goba-Face to face social interaction by bringing people together in the real world. There are hundreds more services like these that cater to narrower slices of social interaction, but it’s not all rosy in the specialized social media world. There are gating factors all markets need to overcome to move to specialization. For cars, it was a market large enough to warrant specialization plus the “sharing” of key parts like engines and chassis. For social media to specalize, it needed a home base, like Facebook, to provide login, authentication and open APIs to cross-post content and opinions. Facebook has enabled the growth of these specialized social media sites. It’s a good thing they did, or Google would have done it and Facebook may not had nearly the lead they have today. This doesn’t mean Facebook will continue to leave its door open forever, though. Another potential growth-inhibiting factor is obvious; the number of active users and friends. There has to at least be enough users and friends to warrant going there in the first place. This is killer #1, but is facilitated by Facebook’s APIs. With today’s UIs and interaction models, I believe that consumers can really only tolerate one major social media “hub” like Facebook then one, maybe two specialized social media sites that are somewhat connected back to the home base. This could change over time due to aggregation work like Microsoft does with its “People” apps, but for now it’s a reality that there’s only so many sites we can handle. The final growth inhibitor is linked to the first. If you cannot gain scale, then you won’t be large enough to make enough money to stay in business. Most social media experiences who pass gate #1 fail gate #2. Can we learn anything from a pre-teen girl’s reaction to a $100B company purchasing a tiny company with less than 15 employees for $1B? I hope so. I know I did. Consumers are very picky and if we offer them thin enough social media slices with enough mass to be considered a community, they like it. We only have to look at Instagram and Pinterest’s fast growing bases of active users as evidence that this is only the beginning of the social media specialization revolution. What does this mean for Facebook? Facebook needs to be the best “home base” it can be, integrating and facilitating traffic between smaller, specialized social media services. While Facebook has trumped Google many times in the last few years, they should get the YouTube playbook from them to show them how to do a branded integration the right way.